I've always have had a thing about notebooks. It started when I was a child. I kept journals of one kind or another for as long as I can remember. 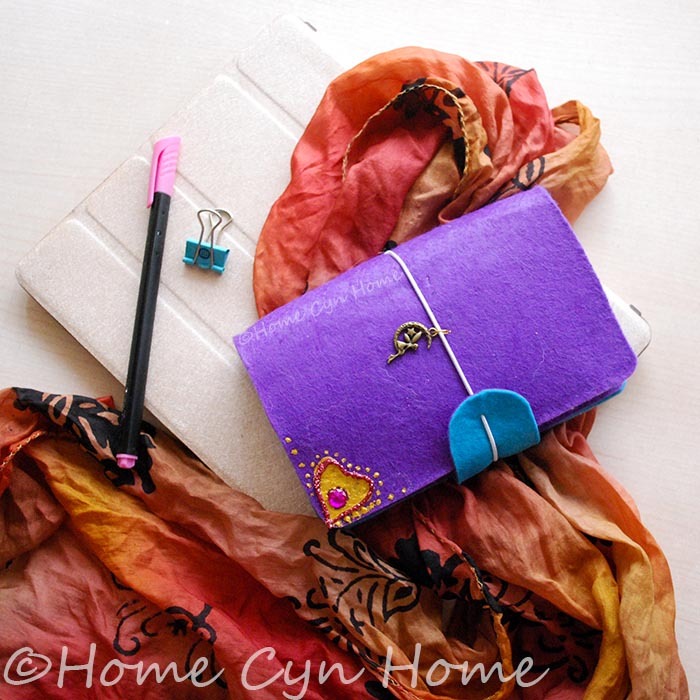 Be it a sketch journal, a typical thought journal, or a travel journal. However, nothing made me feel more grown up than the time I had enough activities to keep track of (I was 15 years old). It meant I could FINALLY make full use of a planner. I went through a lot of different ones, Filofax-type included. Right now, I use a regular diary for my everyday planning, it's huge, and it stays at my desk, with everything I need to keep track of in a day. 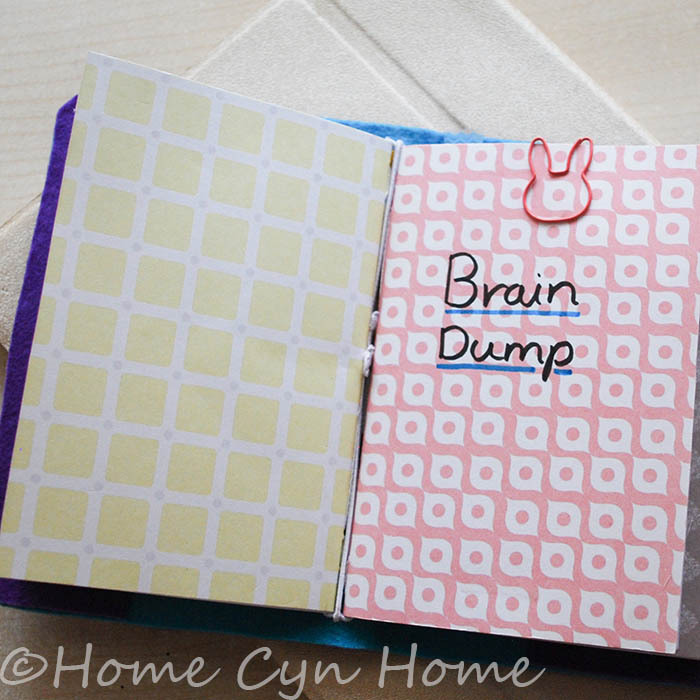 The downfall is that it is bulky, and if I step out of the house, I just don't feel like taking it along with me, especially since I already have a "brain dump" notebook in my purse. 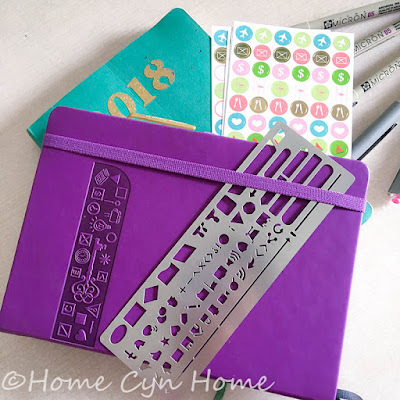 This makes me miss my old Filofax-type planners. 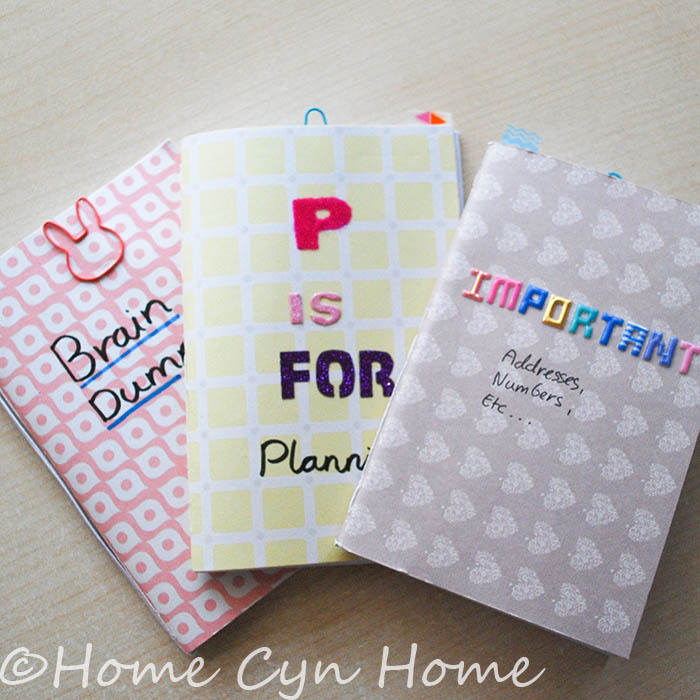 I had enough sections in it to keep nots, jot down ideas, keep important addresses and number along with my schedule, in a compact format. It wasn't perfect, but it was close enough. Last year, I came to know about the famous "Midori" traveler's notebooks, and the flexibility they offer. For those who've never heard of them, Midori Notebooks are basically just a leather cover with elastics inside to hold saddle stitched notebooks called inserts together. They kind of look like the old school journals globe trotters kept back in the days. The advantage of that system is that you can keep more than one insert inside, and once it's full, you remove it, and replace it with a fresh insert. The downside? Midori notebooks and inserts are REALLY EXPENSIVE, even more so in India. This lead to many coming up with DIY versions of the famous notebook which lead to the creation of the term "Faux-dori" (which I think is stupid). Most online tutorial will show you how to make a leather traveler's notebook without necessarily teaching you how to make your own insert on the cheap. The notebook cover itself can really be made out of just about any material, provided it is thick enough to hold it's own. With that in mind, I decided to make a no sew traveler's notebook with felt. 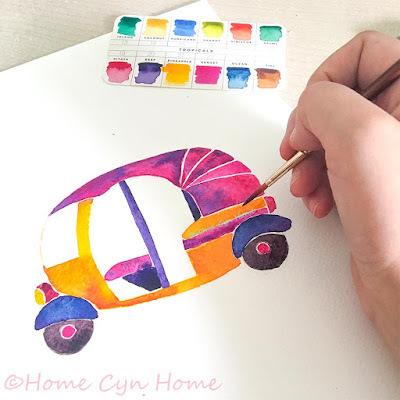 And because inserts are hard to find in stores in India (or downright expensive) I also decided to make my own paper inserts. I forgot to take step by step pictures as I was making it, but have enough similar material in different colours to illustrate my tutorial, bear with me! 1) Two A4 size sheets of felt in your choice of colours, preferably with an adhesive size, it's OK if you just find regular felt. 11) A thick and strong piece of cardboard or a cutting board (something thick enough that the box cutter won't cut through). 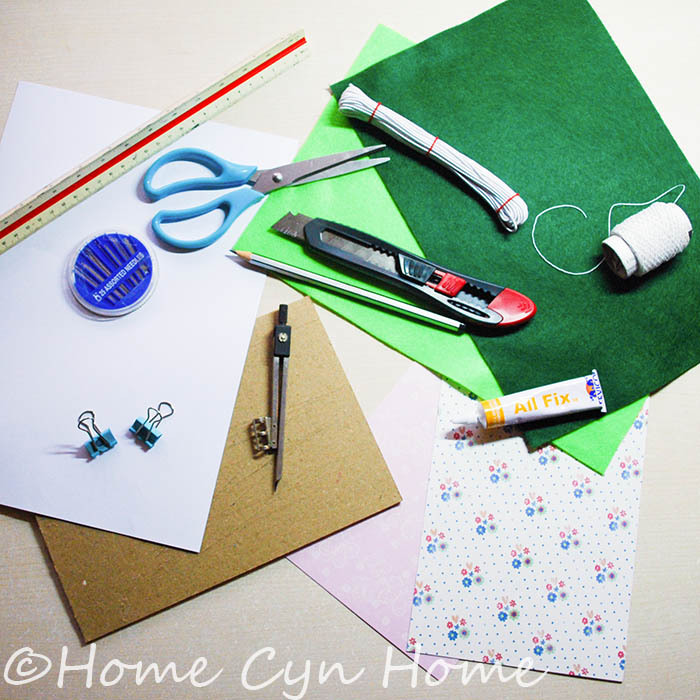 All these items above are the things you will ABSOLUTELY need to make your notebook cover and inserts. Not that my notebook is a NON STANDARD size. This is the perk of doing everything from scratch, you can control that size of your inserts along with the cover. In the tutorial below, I give you my own measurement, if you feel confident about it, feel free to change my measures and make a bigger or smaller notebook for yourself. Let's start making the inserts first! My traveler's notebook contains 3 inserts, each being 13.5 cm high and 9 cm wide (the width of a passport but slightly bigger in height). 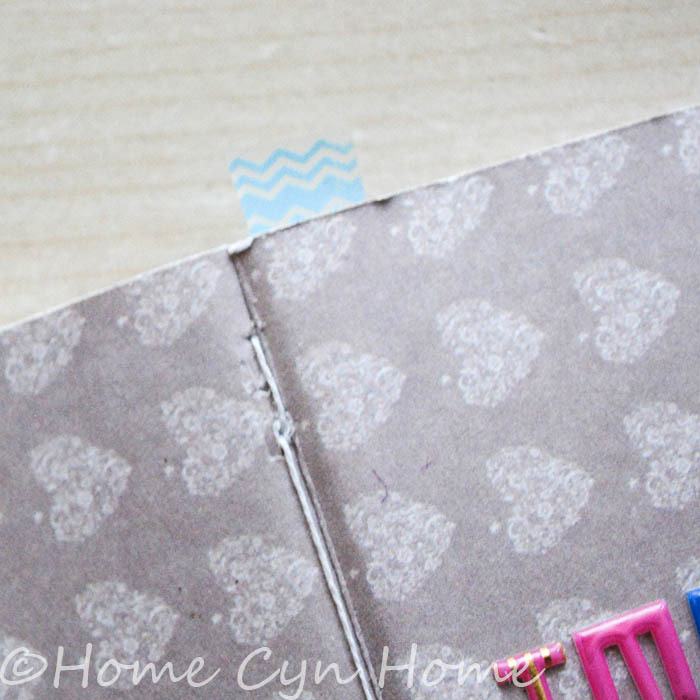 1) Take one sheet of scrapbooking paper in the colour of your choice and measure it to get the height of your insert. In this case: 13.5 cm. 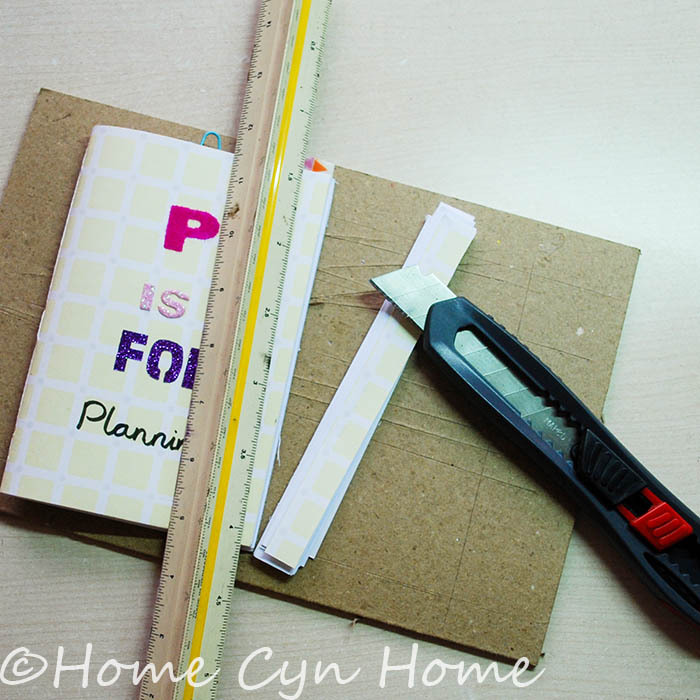 You don't need to worry about the width just yet, just cut across the length of the scrapbook paper sheet for now. 2) Next, take 14 sheet of white A4 printer paper and cut in half (you'll end up with to piles of A5 paper doing so). 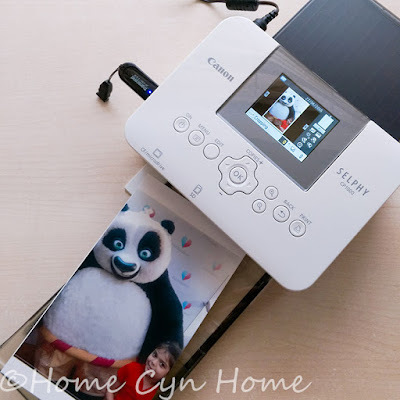 3) Taking one pile of now A5 paper, place the scrapbooking paper you cut in step 1 and place it on top of the pile. 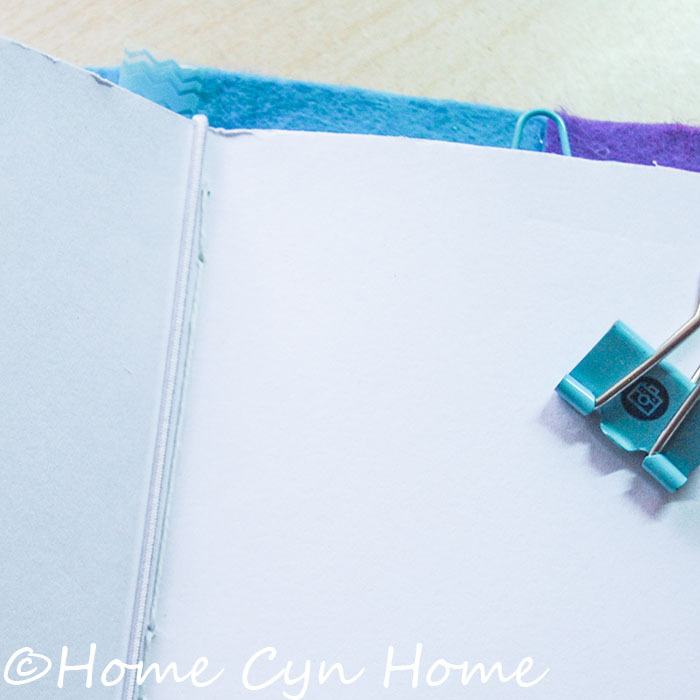 Hold everything neatly together with the 2 binder clips and trim all the excess white paper with the box cutter so that the paper matches the size of the scrapbooking paper. Now all your paper should be about 13.5 cm high and have the full length of the scrapbooking paper. 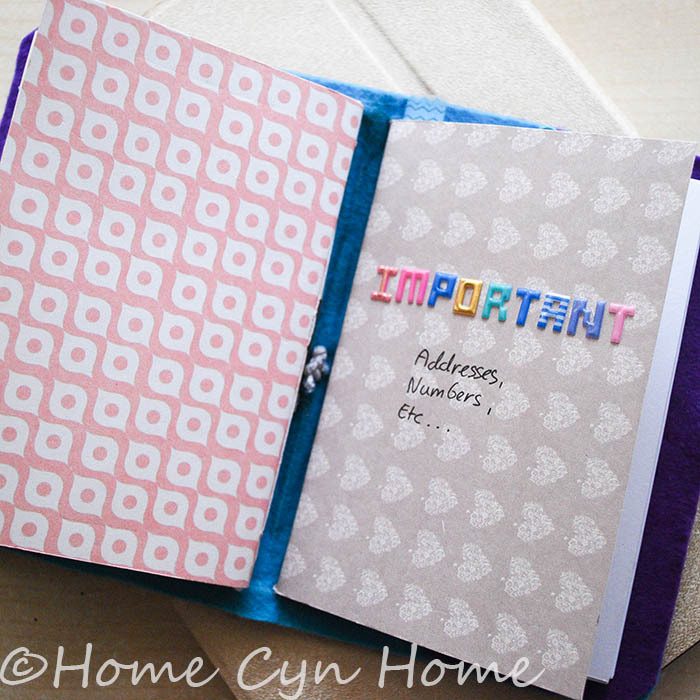 4) Fold the piece of scrapbooking paper in two making a distinct crease in the centre, to mark where the spine of your finished insert will be. At this point ignore the width still, all you want is a insert cover that is 13.5 cm high. I can't stress it enough. 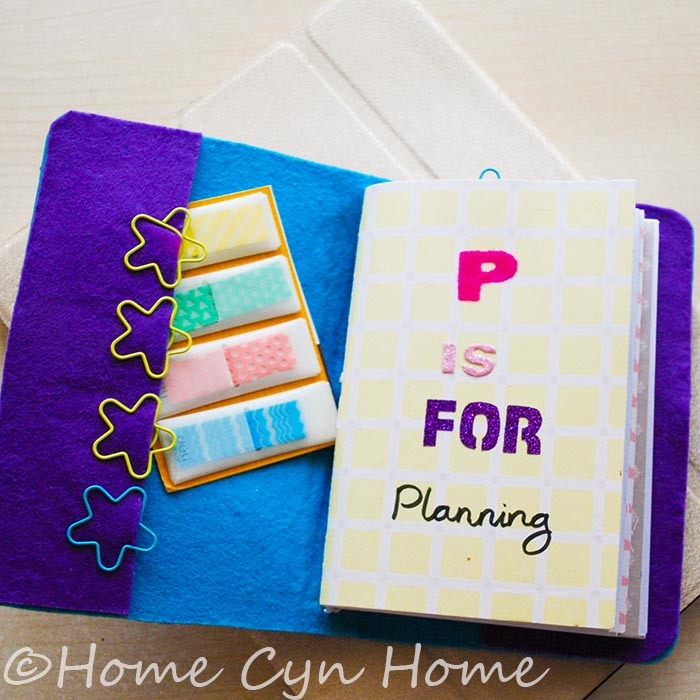 5) Again, secure the scrapbooking paper cover and the white paper sheets all together neatly with binder clips. 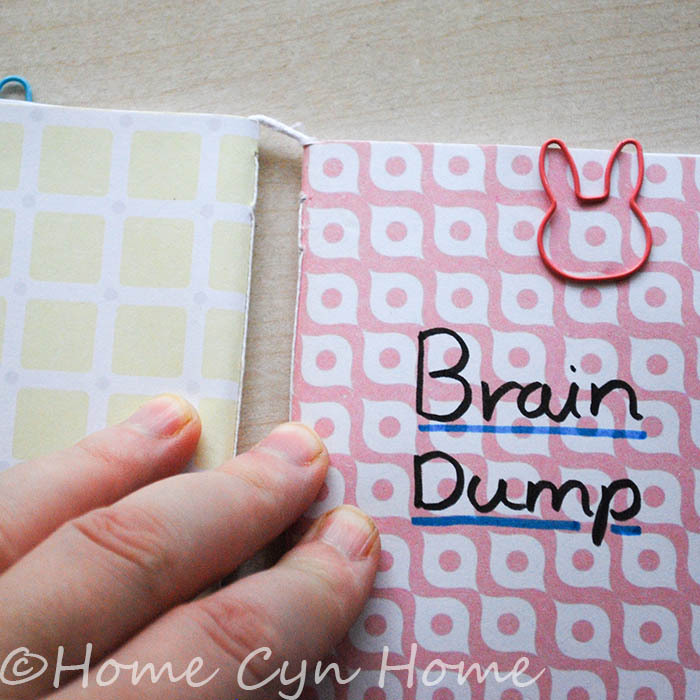 7) Close your notebook insert like a notebook. NOW is the time to think about the width (yes finally!). Voila! You have one insert done! Each Insert is made with 14 sheets of A5 paper folded in two. Repeat the process above for each inserts you plan to make. Let's make the traveler's notebook cover now! 1) Take your two A4 sheets of felt. 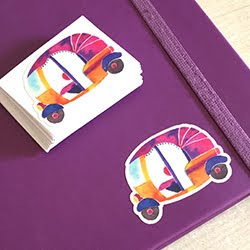 If you managed to find the type that has an adhesive backing, great, you just need to peel of the adhesive protective paper and paste the two sheets against one another to make a thicker looking A4 sheet. 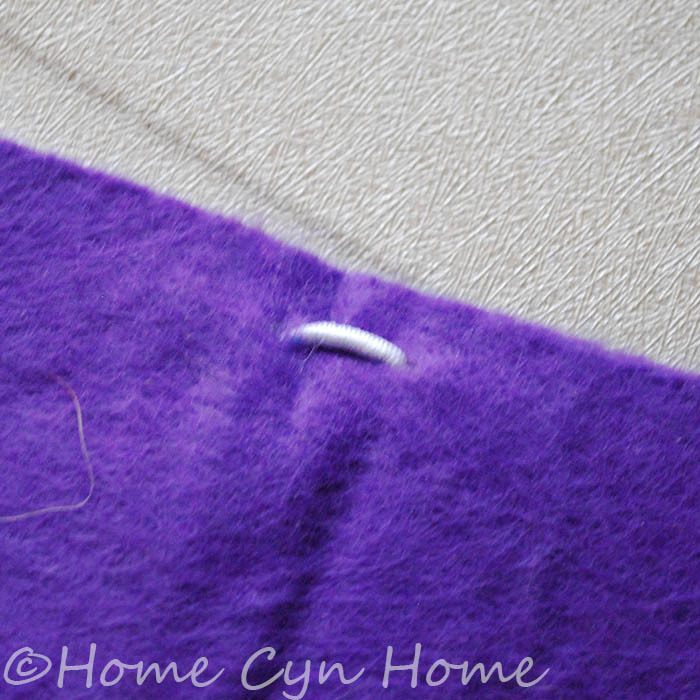 If you just have regular felt, you will need to use some fabric glue and spread it all over one of the felt sheet and apply the other on top and let it dry for a while. 2) Next, cut a rectangle of 21.5 cm x 15 cm in your felt. Round the corners a little using a pair of scissors. Keep the excess felt, you'll need it to make the pockets. 3) With a pencil, mark the middle of your rectangle, this will be the centre of your notebook's spine. On that line of pencil, mark the middle again, this will be where the elastic that will close your notebook will be. 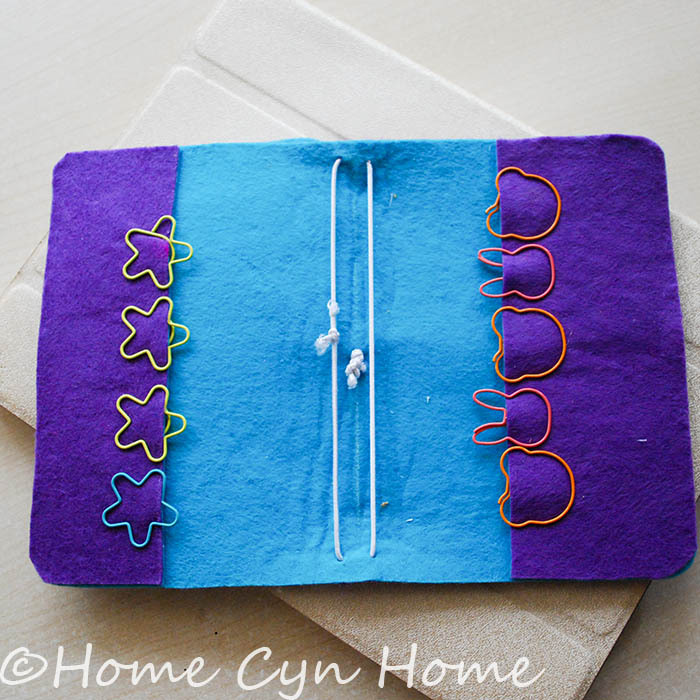 Place once of your insert centred between the top and bottom of your felt rectangle to determine where the holes for the elastics should go. Then measure 0.5 cm on each side of your vertical pencil line, This is where the elastic will go through. Note that we are only going to have two elastic lengths, but will store 3 insert notebooks inside. It's NORMAL, don't worry about that just now! 4) With your sharp pointy tool or compass point, punch 2 holes at the top (where you marked them in the previous step), 2 at the bottom, and one in the centre of the spine. 5) Take a length of elastic cord that is twice the height of your felt rectangle plus a little extra to tie. Starting from the top, inner side of the cover, pass it through the hole so the tip is on the outer side of the cover. Pull your elastic thread down to the hole that is at the bottom of the cover, right underneath the one you just passed through on top. Your cord, should now be on the outer side of the cover once more, but at the bottom. Pass it through the other hole to bring it back inside the cover again. Now tie the two extremities to the cord together so that your elastic is snug, but not so tight that it pulls the edge of your cover inward. Open the 3rd insert to the centre page, and slid it through the second elastic and close. 7) In the leftover felt, cut two strips of the height of your notebook and glue them to the edge of your cover like in the picture above. Trim the excess, especially in the corners. 8) Time to work on the elastic band that will keep the traveler's notebook shut. You can either do it without the little felt pad, or with it. It is really entirely up to you. I chose to make a little "pad" because it is cute and prevents the cover from getting deformed. Thread a small length through the holes in the "pad"and centre it in the middle of the elastic length. Now, pass the two extremities of the elastic cord through the hole you punched at the centre of the cover's spine, from the outside toward the inside of the cover. Your cute traveler's notebook is finished! Now you can embellish it a little if you wish, or leave it as it is, your choice. 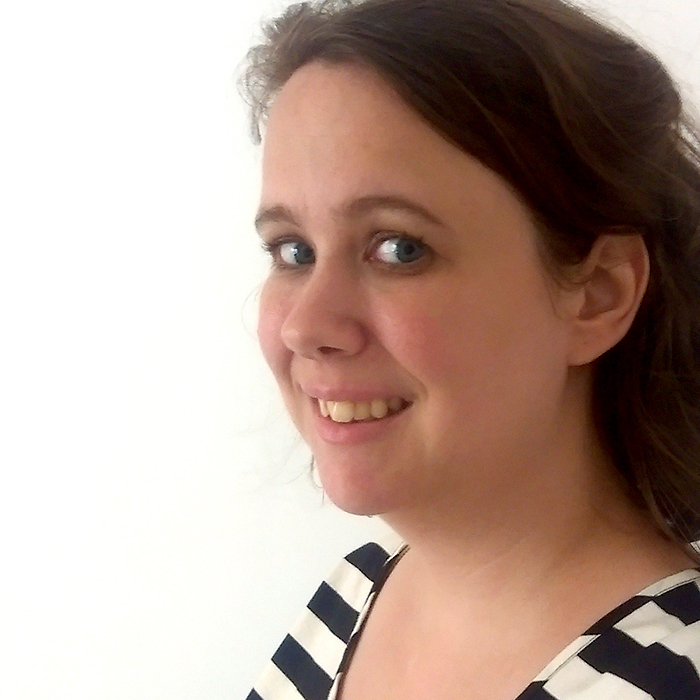 - For a start, I drew a little design in the bottom front corner of mine. With my trademark 3D liner pain, that goes without saying. I did so to let me identify which side of the notebook is the front. - I added a little charm to the elastic band that keeps the traveler's notebook shut. I simply took one of the charms I bought when I made my bookmark charm project and put it on a metallic ring and slipped it on the elastic cord. - Last but not least, I personalised the inserts a little bit, BUT, That is the topic of a new blog post altogether, I'll leave you at that for now. 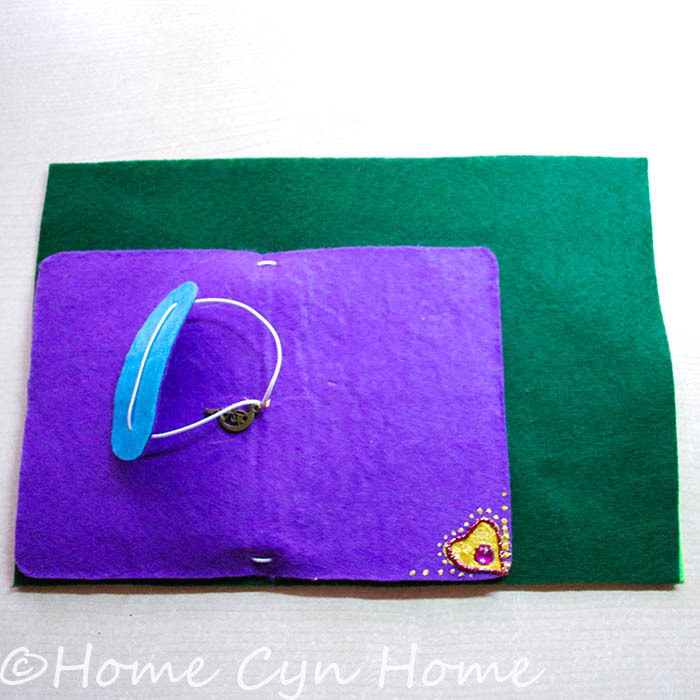 - The A4 sheets and thread and assorted embellishment adds to roughly 50 rupees. This means the TOTAL value of the material used for my ENTIRE notebook comes at 175 rupees!!!!!!! Just as a comparison, one Midori brand passport size insert costs 1345 rupees on Amazon, the Passport size Traveler's notebook made of leather costs : 5413 rupees! If you manage to get your hand on some quality leather, you can make your own for a fraction of that price as well following the same principle as above. So unless you are a brand snob, there is no reason whatsoever to spend that much on a traveler's notebook. If you want better quality white or off white paper in your insert, buy some thicker one from any stationary shop. As for calling all the "imitiations" Faux-dori, can we stop that BS already! Traveler's notebooks existed long before Midori came around, and people called them...... Yep, that's right : Traveler's notebook. That's a really cool project, thans for sharing ! Pad. Super cute! I love my traveler's notebooks but lately I have been not putting them in covers! I use them up so fast I hardly need to. Visiting from BOBB on FB. I have various notebooks all around my home, some hard bound, some spiral bound, some saddle stitched. This one is really just for me to keep what I need on the go. Hi! What is the thickness of the elastic band? Is it 2mm or 1? 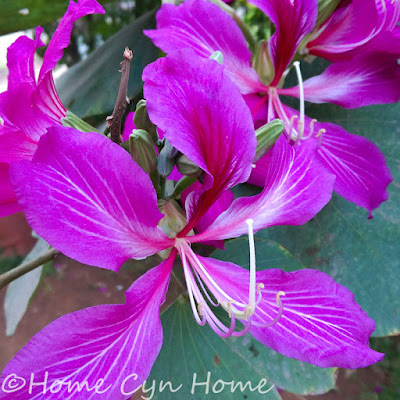 Sorry I am seeing your comment only now, there has been some email notifications issues as of late.